Southern Illinois University Edwardsville will host approximately 400 local 5-12th grade students at the regional Science and Engineering Research Challenge (SERC) on campus Saturday, March 18. The 33rd annual competition will be held from 8 a.m.-4:30 p.m. in the Morris University Center on campus. The event features the finest science, technology, engineering and mathematics (STEM) focused student projects from a 10-county area. The projects promote independent critical thinking, and encourage budding scientists to use the scientific method to answer a research question, carry out experiments and write their results. “The SERC is dedicated to celebrating science and achievement, and encourages STEM exploration to students from elementary through high school,” said Colin Wilson, manager of the SIUE STEM Resource Center. “It offers an opportunity for students to showcase their abilities. Students are eligible for a number of awards, as well as a chance to move up to the next level of competition. Twenty-six winners from the SIUE regional advance to the state competition. Top prize is an all-expense paid trip to compete at the Intel International Science and Engineering Fair in Los Angeles. The public is welcome from 1-3 p.m. to view student posters and talk to the young scientists. 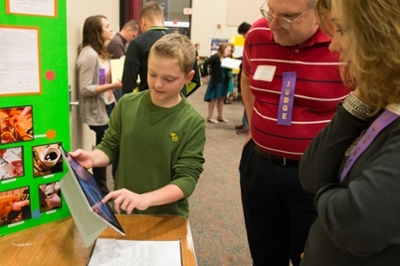 Photo: A student presents his STEM-focused project to a pair of judges during the Science Engineering Research Challenge held at SIUE.